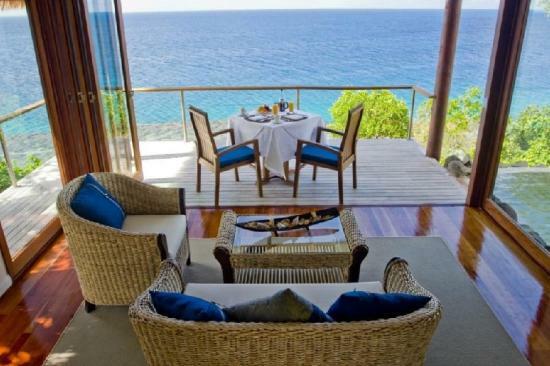 Want the ultimate Fiji vacation romantic getaway? 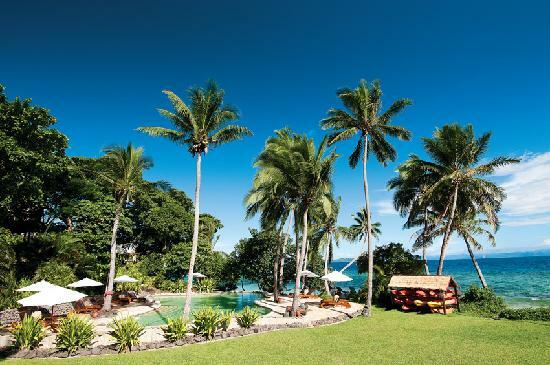 Discover the stunning Royal Davui Island Resort one of Fiji's most stunning adults-only island resorts. - Who does Royal Davui suit? Who does Royal Davui Fiji suit? 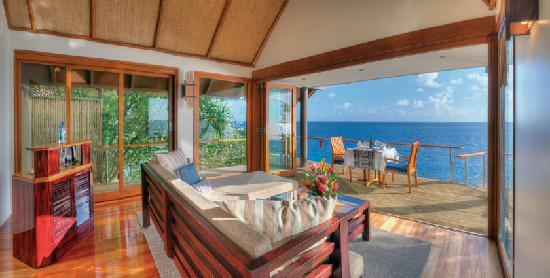 It suits couples wanting a luxurious private tropical island getaway. Persons under 17 not allowed. 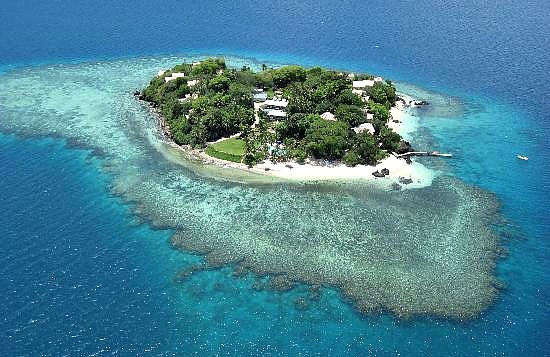 Spectacular Royal Davui Island Resort is situated on it's own tiny 10-acre island in Beqa Lagoon around 25 kilometres (16 miles) from the mainland. 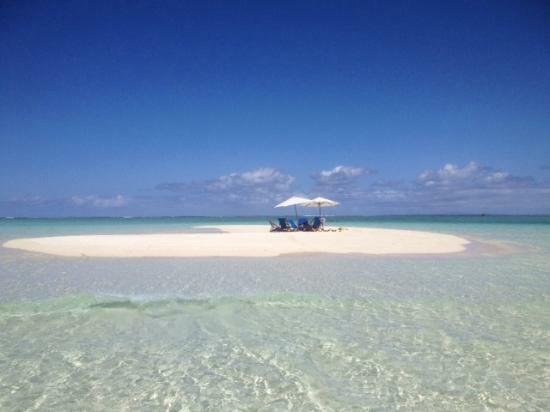 It's a genuine island resort with the resort encompassing the entire minituae Royal Davui Island. There are two main options. A combined 20-minute domestic air transfer from Nadi Airport followed by 30-minute boat transfer. Or for an immediate quick fire transfer via a helicopter or seaplane leaving from Nadi Airport. For those wanting to explore the mainland, you can hire a car from Nadi Airport and they will meet you at their jetty on the mainland at Pacific Harbour. All details except the first option, which you organise upon booking, can be found at our Transport in Fiji section. Not surprisingly, dining is centred around privacy. The restaurant serves fresh meals using locally caught seafood and the bar refreshing alcoholic beverages. The romancing couple have the option of, escaping the crowd of a maximum of 32 island guests, and have dining in on the verandah or on the lounge with staff coming in with pre-meal setup. A beach picnic on one of the island's three beaches is quite special. A stunning option and wildly popular is the remote sand quay picnic, as shown in the picture! A 7-minute boat ride away, you'll be dropped off and you can spend a few hours in absolute seclusion! Could it get any more romantic than a remote sand quay picnic? Probably somewhat surprisingly, tiny Royal Davui Island has a large selection of activities for you to choose from when not relaxing in private. Being close to the mainland including the Coral Coast, there are more sights and activities that you can poke your kava-infused coconut shell at. Royal Davui Island Resort being centrally located in the world famous Beqa Lagoon, all dive sites are 30 minutes away suiting all levels. The perfect romantic island getaway just wouldn't be complete without a day spa providing massages, treatment, facials and more. Minimum rates start at around US/AU$800 per couple per night. The rates include non-motorised activities and generally all meals.